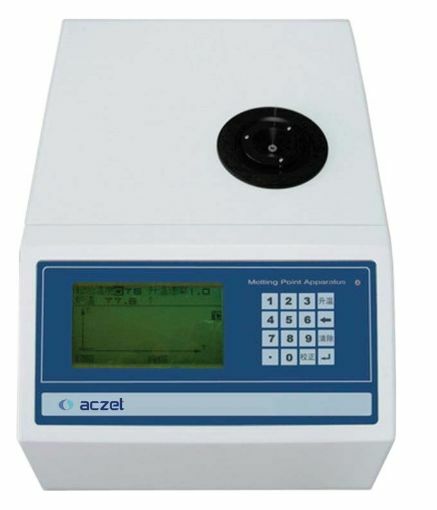 Description : AMP 2A/2 melting point apparatus is an automatic, uncomplicated, and accurate process for determining a sample’s melting point. The starting temperature and heating rate are selected with a touch of the function keys . Simplyplace1 - 3 mgin to disposable sample tube and insert into instrument; the rest is automatic. When the melting point is achieved, a visual and audible signal is given and the temperature is displayed. The AMP 2A/2 makes use of the optical behavior of substances to detect their melting point, i.e., it measures the reflection of incident light in the crystalline state and the increase in light transmittance while heating. RS-232C interface capability allows connection to the CPR02 printer for GLP applications. Measurement of 3 samples simultaneously (Optional). Platinum resistor for the precise temperature measurement. Capillary sample tube as stipulated by pharmacopoeia. Application : Melting Point Apparatus measures the melting point of a substance i.e. the temperature at which the state of the substance changes from solid to liquid. The actual melting point is an indication of the purity of a substance and hence an ideal tool for the quality control of medicines, perfumes, dyestuff and other organic crystalline substances.